have mercy: Minimalist Wintry Wardrobe: Tah-dah! Here's the line-up! 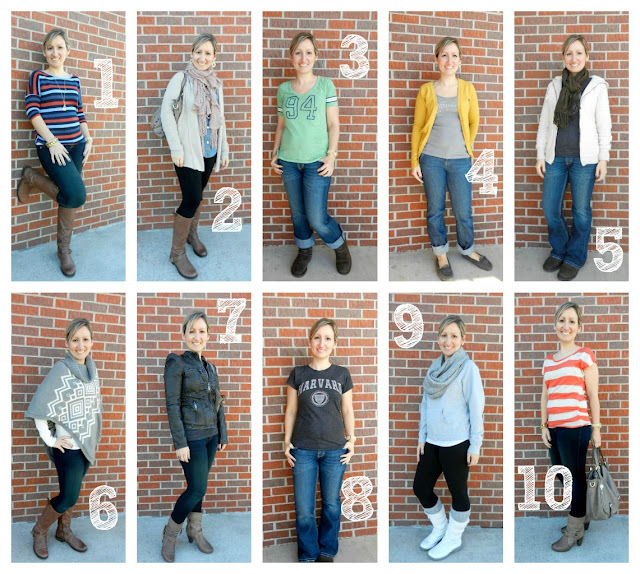 Ten casual outfits for my everyday life. Photo credit goes to Trina at Beginner Beans who's an expert with the point-and-shoot. In fact she blogged about it here and also about how to use PicMonkey, here. PicMonkey's an online photo editing program I used to add the pizzazz to these. Forty-two pieces in all, but a girl's got to have a coat in Nebraska, and below you'll see mine. They bring my total to 44 pieces. What you don't see here is my workout clothes, a couple things I lounge in, pjs, or dressy clothes. I already got rid of half my pjs and plan to go through my workout clothes, but probably won't drag you along for that ride. I choose this length of coat because it's warmer and when I sit, I never have that cold strip of exposed back. I also look for a coat that zips or buttons all the way up because I like to hunch into the neck like a turtle, sealing it off with my chin. 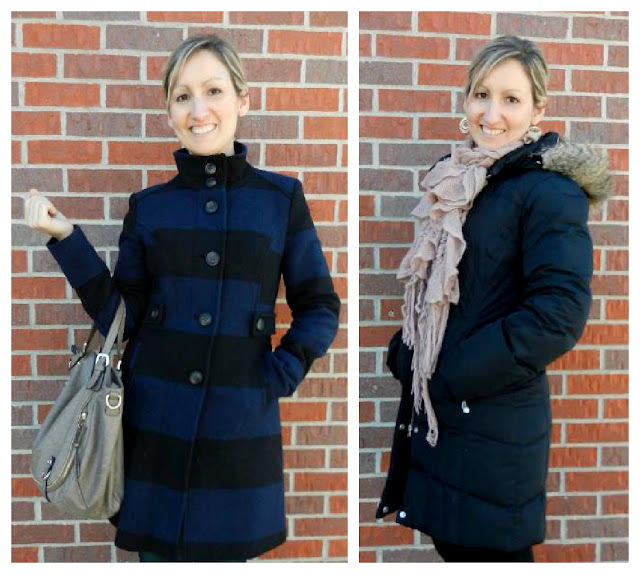 The striped coat is from Old Navy and I swear by their small sizes. Nothing's better than a coat that fits my small shoulders. My puffer was another splurge from Eddie Bauer. I wanted it three winters before I finally realized I wouldn't find it cheaply and made it my Christmas present. It's another investment I've been oober-happy with. My dressy clothes are in flux right now because my brown heels are dying. (Moment of silence, please.) They've been with me eight years and we've had a grand time, but they're making a suspect clickity-clack. I believe a warm grey heel will replace them. I'd also like a navy skirt, but finding one is proving difficult. So I'm back-burnering the dressy clothes until I find those pieces and see how things shake out. In the meantime, I have these two outfits that I love. I plan to have two more eventually because I prefer not to wear the same thing to church in a month. I know. I just earned my high-maintenance badge, but I'm a sucker for variety. I'm sure you thought you were done and don't want to bore you with details about these, except for this. 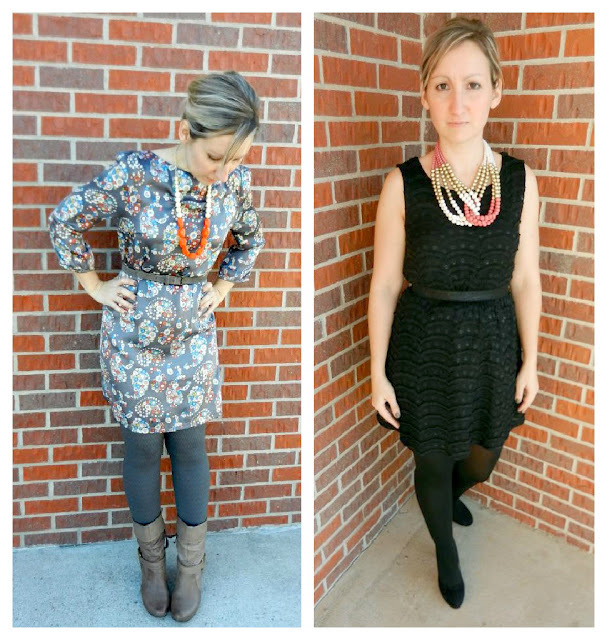 I forgot my navy belt the day we took photos, so for my sake, imagine the outfit on the left with a navy belt. That is all. Thanks for going through my wardrobe with me! You make everything more fun. So fun to see it all together! Looks like lots of mix-and-match potential. And I just love that grey dress. You're a very stylish minimalist~ love it!